Helena Kay: Alto/Clarinet; Adam Jackson: Alto Saxophone; Samuel Tessier, Michael Butcher: Tenor Saxophones; Heather Macintosh: Baritone Saxophone; Tom Walsh, Sean Gibbs, Joshua Elcock, Christos Stylianides, Cameron T. Duncan, Tom Clay Harris: trumpets; Michael Owers, Liam Shortall, Kevin Garrity, Richard Foote: trombones; Joe Williamson: guitar; Fergus McCreadie, Pete Johnstone: piano; David Bowden: Acoustic Bass; Stephen Henderson: Drums. Having made a splash in the jazz world as a teenager, playing with Gary Burton, it seems fitting that Tommy Smith has been bringing together the cream of Scottish Youth Jazz since the early 2000s. 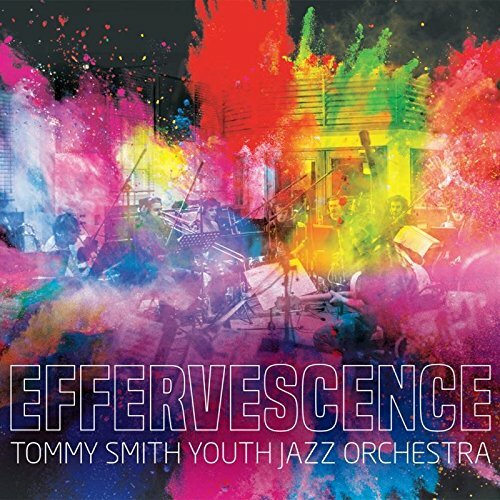 The first two albums of the Tommy Smith Youth Jazz Orchestra (Exploration, and Emergence) were well received, and this third recording continues the approach to recording high quality jazz. The ‘orchestra’ in the title rather disguises the fact that this is a Big Band, playing tunes with the gusto and verve of bands from the heyday of this style. So, the set kicks off with a Woody Herman tune (‘Apple Honey’) which rollicks along for around 3 minutes and manages to cram in some fine soloing and brash ensemble playing in this short space of time. This sets the tone for a set which, for me, peaks with a splendidly explosive take on Dizzy Gillespie’s ‘Things to Come’. Again, the soloists put in fine turns and the ensemble playing swings exuberantly. This is not surprising given that the orchestra has a sprinkling of award-winning players and that their leader can really push the big sounds that they produce. The excellent musicianship on these harder bop tunes (together with Benny Golson’s ‘Blues March’, and an original by Sean Gibbs called ‘Tam O’Shanter’) showcases a fine collective sense of rhythm and joie de vivre in the playing that is infectious. There are also pieces which stretch the players in terms of dynamics, particular in the development of mood on slower numbers. These include Jerome Kern’s ‘The Way You Look Tonight’, Wayne Shorter’s ‘Nerfertiti’ (oddly, listed as a Miles tune in the press release), and two of Chick Corea’s tunes ‘Humpty Dumpty’ and ‘Bud Powell’. The arrangements of these pieces, by Florian Ross or Christian Jacob, push to players and there are occasions where the sheer size of the orchestra seems to overwhelm the delicacy of some of these tunes; having said that, the soloists on these arrangements turn in sterling performances of warmth and depth. In all this adds up to a set of pieces that not only showcase some tremendous new talent in jazz but also a coherent and well conceived collection of tunes which show that Big Band jazz can still have something worthwhile to say in today’s music scene.